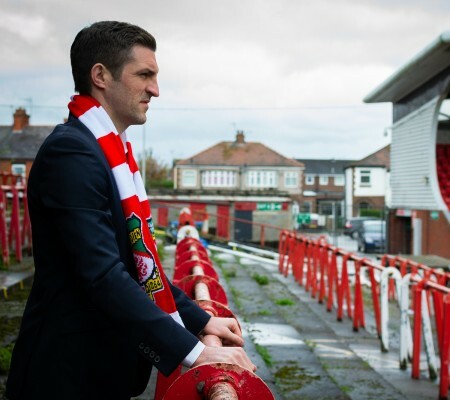 Former Wrexham AFC manager Sam Ricketts. has joined Shrewsbury. Sam Ricketts has taken charge at Shrewsbury Town – and Wrexham have launched their search for a new manager. Wrexham’s club statement said: “We did everything possible to retain Sam’s services. However, once this interest became known, Sam expressed his desire to speak to them regarding their vacancy. “Shrewsbury triggered elements in Sam’s contract enabling them to approach him and, at that point, we were obliged to allow him to speak to them. “Following his discussions, Sam informed us of his intention to take up their vacant manager’s position. ”Wrexham are in a strong position after 22 league games of the 2018-19 season. We would like to thank Sam for his efforts and for the work he did while at the football club. Former Wales international Ricketts took over as Wrexham manager in May and the Dragons are fourth in the Vanarama National League table. Assistant manager Graham Barrow, an ex-Wigan team boss, takes charge of the first team on an interim basis. Shrewsbury spent three weeks deciding on a new manager following the departure of John Askey last month, having won only four of 17 league games. Goalkeeping coach Danny Coyne spent six matches in caretaker charge, winning five of them. Barrow had said Ricketts was ‘indecisive’ over his future. Coaches Jussi Jaaskelainen and Carl Darlington joined Barrow in taking charge of their FA Cup goalless draw against Newport County. Barrow said: “The players were puzzled as much as anything. There were blank looks on their faces, a bit down. “We had a little bit of work to do in terms of lifting them before the Newport tie, but nobody’s died, you have to get on with the job. Wrexham are at home against Eastleigh in a League match this Saturday before travelling to play Newport in an FA Cup replay the following Tuesday.